Growing Lettuce and Salad Greens - Everything you need to know. Lettuce and salad greens are very popular in home gardens. They are fast and easy to grow in garden beds or containers. Lettuce is divided into two types, the head and leaf varieties. Heading types take longer to mature and therefore need a longer cooler growing season. They also do better in full sun. This variety does best as transplants. They get a good growth before the weather warms up. The leaf varieties are more popular, grow quicker and will tolerate some shade. If you scatter the seeds of leaf varieties they do not need thinning as you can start cutting them once they reach about 3 inches. There are many types of salad mixes available which are great as you get a variety of different seeds in one package. 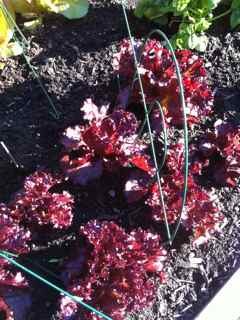 I also love to grow other greens such as mizuna, arugula, mustards, cress, endive and chicory for using in my salads. Location - These are cool weather crops and will thrive in partial shade. Soil - Loose, rich loam with pH 6.0-6.8. Soil Preparation - These vegetables are very shallow rooted. Rake in 1 inch of compost or aged manure before planting. Add more compost or compost tea every 2 weeks around the base of the vegetable plant. Planting Times - For transplants sow indoors early March to mid July; transplant at 4–6 weeks. I you are going to seed directly, do it as soon as you can till your soil. Sow every 2 weeks for succession planting. Planting Instruction - Provide some shade during the summer months. Remay will work well. Watering - Regular watering; water more often during the hottest part of summer. Disease & Insects - Use crop rotation. Slugs – clean up hiding places like garden debris, wood anything they can get under during the daytime. Flea beetle like the oriental greens so keep covered with remay making sure it is tight to the ground or grow in plastic tunnels. Harvest - Harvest plants before sun hits them or spray them before cutting. Cut the plant just above the base with a sharp knife. The plant will grow back and then it can be cut for salad greens. Storage - Likes high humidity and cool temperatures. Wash leaves, drying them in a salad spinner and then storing them in a tightly sealed plastic container with a cloth at the bottom to soak up moisture. They will store this way up to a week.